I can smell the turkey cooking now! It’s not too long till Thanksgiving. The sweet cranberry sauce is on the table while the dinner rolls are in the oven and the turkey is in the fryer. Everything is going smoothly, everyone is enjoying themselves, and dinner is almost done. The last thing you think about is something catching on fire. Did you know that when you fry foods you increase the changes of a cooking fire? The U.S. Fire Administration says that Thanksgiving is the peak day for cooking fires. Don’t be a part of that statement. 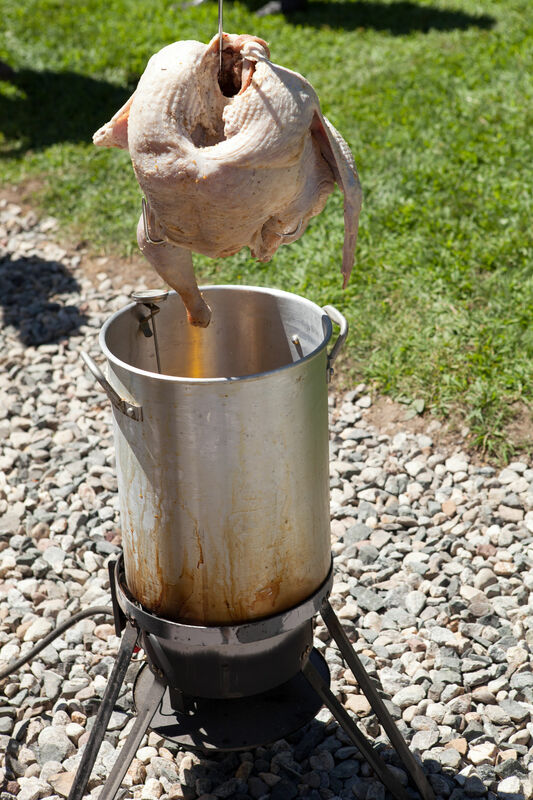 Protect your turkey dinner by being aware of turkey fryer dangers and knowing how to prevent them. If hot oil spills on a burner inside the house it can easily cause a house fire. Hot oil splatters can severely burn someone’s skin, eyes, or clothes. Make sure to use the right amount of oil. If you use too much oil it can over flow when placing the turkey into the fryer. Be cautious when placing the turkey into the fryer. You don’t want to get oil everywhere by putting the turkey into the fryer too fast. Most deep fryers you find have a lack of stability. They can easily tip over and spill which causes the dangerous hot oil spills and splatters I talked about above. When using a deep fryer, cook outside and on a flat level surface to help stability. Cook far away from the house in the yard. Do not cook on a wood platform. That’s just asking for a fire! Fox News says if oil gets to 400-425 degrees it can catch on fire itself! Managing the temperature of the oil is a must. Most oil should stay around 350 degrees but always label to see the limitations of temperature. Someone should keep eyes on the fryer at all times. This is to make sure that the temperature is controlled and nothing catches on fire. If the oil starts to smoke that is an indication that the oil is getting to hot. 31937656 – raw turkey about to be carefully dropped into the outdoor propane frier pot. Make sure to take caution when touching the handles or sides of the fryer. They can easily burn you because of the scolding hot temperatures. Make sure to follow these safety rules when frying a turkey. When using a deep fryer, keep it outside and away from the house. Do not have the turkey fryer on a wooden deck. Keep turkey fryer on flat level ground. Use the right amount of oil. Keep the oil temperatures under control. Too hot is too dangerous. Do not let children by the turkey fryer. Keep fryer away from anything that is flammable. A delicious moist turkey is key to a successful Thanksgiving dinner. Don’t risk the turkey or your house by trying to deep fry it! And if you do choose that route, the safety tips above will surely help. There are ways to avoid frying the turkey all together and cook it a healthier safer way. 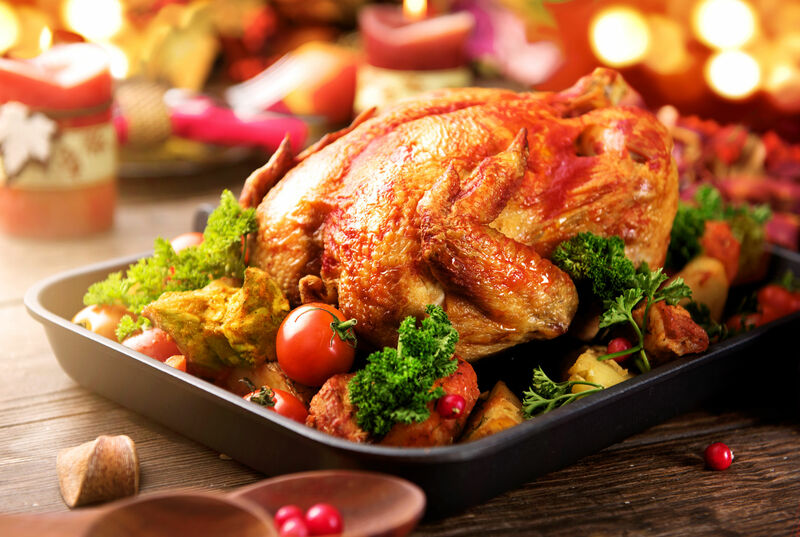 Instead of frying the turkey in a deep fryer you can easily cook it in the oven. Less oil equals less fat. Wishing you a safe, healthy, and happy Thanksgiving this year!